We have almost wrapped up Day One! Considering that the journey began at about 2pm Texas time on Monday and it's now 9:45pm Spain time on Tuesday, I'd say that's one heck of a first day. The journey began in Spring, Texas where we stayed on Sunday night with Aunt Mary and Uncle Kelley after our going away shindig with family and friends in Pearland. On Monday, these fun gals took us to the Intercontinental airport in Houston after a delightfully hilarious lunch at Cheddar's. A good American send-off! Thank you so much Mema and Aunt Mary for helping to calm us through all our last minute stresses and woes. I know we weren't much fun to be around, ha! And I feel so lucky to have such great family. 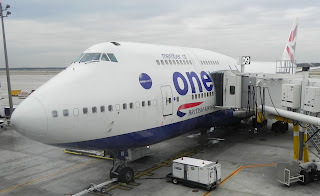 This double-decker plane was our cramped home for 9 hours across the pond. Don't let the size fool you; I felt like the paupers on the Titanic shoved in the underbelly of the ship! The flight from London to Barcelona was only 2 hours and was much more cozy. We got the bulkhead seats with no one in between. Sweet, sweet snoozing. For our first meal in Spain, we wandered down the Rambla near our hotel and were coaxed into this Mediterranean restaurant by the colorful Venzuelan/Candian musician/waiter. The food was so-so but the experience was fun and relaxing. We took advantage of the Menu del Dia, which is a remnant of the Franco era that still persists today. It's basically a 2 to 3-course meal with wine and coffee for about 8-10 Euros. Restaurants all over town serve them, and you really can't beat the cost for the sheer amount of food. Spaniards eat a big lunch between 1pm and 4pm and then have a lighter dinner of tapas from 8pm to about 11pm. Brian and I connected with his fellow UT MBA classmate Shab, and we all braved the crowds at Plaza Cataluna to purchase our cell phones. I'm proud to say that we completed about 95% of the transaction in Spanish! The sweet salesguy took pity on us at the end when he started describing how the prepaid variable rate plans work and broke it down in English. Getting phones was one of our two big to-dos (the other being finding a HOME!) so we're pretty stoked to have that marked off the list. The red bags are our Vodafone bags. We got the funniest, tiniest little Nokia phones. We told the guy we wanted the absolute cheapest thing he had. They were 18 Euro each (about $24) which included 12 Euro of minutes as part of the package. It's a pay as you go thing and I was so utterly confused that I think I'll finally have it figured out by the time we leave. Thursday is Three Kings Day and is an official shut-everything-down holiday here, so the streets were PACKED with last-minute holiday shoppers and decked out with beautiful vivid lights. Tomorrow night there will be a parade down the main Rambla and a party in the streets to commemorate the holy day. I can't wait! Gaudi's beautiful art through architecture is all over the city and we meandered past this treasure on our way to the metro after walking Shab to her Hostel. I'm so excited to wander the city and soak in all these OLD beautiful buildings. I can officially say that I'm finally so excited that I can't even stand it. Ever since we at last made it to our hotel room, got our 200 pounds of luggage situated, and were able to just wander, I haven't been able to wipe the grin from my face. Everything brings memories flooding back. Smells, sounds, familiar oddities...like the way apartment doors only open by turning an exterior key and no knob, the sound of your heels clicking on the marble stairs in the walk-up piso buildings, the feel of the frenetic energy as Spaniards of all ages walk along the streets laughing and talking, the sweet sight of all the little old ladies walking arm in arm down the sidewalk. It's joy. Pure joy. That's what I feel. I have loved everything about Spain since the first minute I walked off the plane in Alicante in 2002, and I'm remembering ever tiny reason why. Even the inconveniences and annoyances are endearing at this point, reminders of how grateful I am to have had this experience so young, to have expanded my worldview at an impressionable age and realize that there are so many wonderful places out there most of us never get to see. Tonight, aside from exhausted, I am grateful to be back in my beloved Espana. It feels like home. Tomorrow - apartment (piso) hunting! Let's hope it goes as smoothly as the cell phone purchase! Buenas noches y hasta manana. Older PostThe Floyds are in Barcelona!